I often allow downloading of small versions of client photos via Gallery. Clients often want to download all of them and find it painstaking to download a single image at a time. What is best way to download all images from a gallery at once? If there is no existing simple way to do this can a "Download All" feature be added? A while back I started writing my own code to create a .zip of all the images in the photos-for-download folder of the gallery and used PHPlugins to add a Download All button to the top of the gallery but (if / when I finish it) it likely won't be as elegant as a built-in solution. 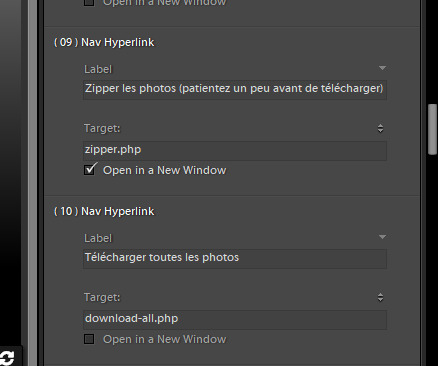 Simplest way may be to just export the images from Lighttroom and zip them into a folder. Put that zipped folder in the gallery's folder and provide a simple text link. True, that is a relatively simple way but requires a bunch of extra steps and means I have to re-export, re-create the .zip, and re-upload each time I update a photo in the gallery. Looking for something a little more automated. The code I started putting together will zip everything in the photos-for-download with some checks ahead of time to see if the .zip already exists and if so whether photos-for-download has been modified since the last .zip was created. I could try to find time to revisit that and see what is left to be coded / tested but thought I'd see if there was some existing functionality I missed or perhaps if CE4 brought a new feature for this (I'm still on CE3). There is no existing functionality. Is there functionality for this in Backlight? Perhaps with the Cart or Client Response Add Ons? Maybe even an option to add all images to the cart as digital downloads and rely on the normal functionality from there? No, that functionality does not exist in Backlight. I thought I remember reading somewhere about an "add all" option for cart. Does that portion exist? sorry all screen captures is in french but you can understand i think. maybe the compress step is useless because photographer can make it itself. next step for me is to try with the CE4 publisher template (gallery template + the 2 files.php) if the new gallery are each time upload with this files to avoid to upload the 2 php files in each new gallery. Is there any progress on this? If the above works? If there is an additional and hopefully simpler explanation of how this would be done in current version. I have the client asking to download all, other methods above are not great, and retail file sharing services were also not a good in this case. Since I have given the CRG as an option for them, it is now embarrassing, and another workaround for them and me. If I understand you correctly, you like to download all images of a gallery at once, not just a selection? With Backlight 2, this can be implemented using phplugins thanks to $this->album and $this->photo being exposed. Thanks, can you provide a more detailed description of instructions plz? Sorry, note really. That's something that would need to be written first.